There are approximately 400 hundred plant species (excluding mosses) at the Sanctuary Mahi Whenua. This includes 140 tree species, many of which are not yet registered on the Unitec’s arboretum list (which contains 220 tree species), therefore contributing substantially to the Unitec’s campus tree diversity. All those plants provide invaluable habitats for many native animal species. Some 25 bird species have so far been recorded at the Sanctuary Mahi Whenua. There are skinks and many species of endemic and exotic fungi, insects and spiders. It is an unrecognised biodiversity hotspot: a biodiversity jewel in the Auckland isthmus. Visit NatureWatch NZ to see some of the recorded observations at the Sanctuary Mahi Whenua as well as the wider Mount Albert area. Planting of the Sanctuary Mahi Whenua started in 1999 -- 20 years ago. It is now difficult to remember that this diverse, biodiversity jewel on the Auckland isthmus started as a grassy area. Tree ecostructures surround the gardened area (lower area) and the food forest (upper area). © Cameron Crosby. Around the Sanctuary Mahi Whenua there are many dahlias (genus Dahlia) flowering. Dahlias are native to Mexico, and tubers were grown as a food crop by the Aztecs. A young nymph of the native katydid or kiki pounamu (Caedicia simplex), a species which also occurs in Australia, uses a petal for shelter. A flower spike of a Heliconia or false bird of paradise (Heliconia subulata) from the headland shelter at the Sanctuary Mahi Whenua. This species originated from the cooler Andean highlands of Peru. It can take several years to flower and the leaves damage easily in the wind. Harlequin ladybird (Harmonia axyridis), a natural pesticide. The wing covers (elytrae) on this specimen are orange with black spots. Caterpillars of the native yellow admiral butterfly (Vanessa itea) found in in the patch of introduced perennial nettle (Urtica dioica). Living between leaves and fruit of a lemon tree (Citrus limon cross) are some endemic leaf-veined slugs (Athoracophorus bitentaculatus). Caterpillars of our endemic kōwhai moth (Uresiphita maorialis) eating leaflets of our Cook Strait kōwhai trees (Sophora molloyi). It is the first report of those carterpillar on this kōwhai species. A female nurseryweb spider (Dolomedes minor) is guarding her eggsac on a rosemary plant (Rosmarinus officinalis). Usually females are only found on their nursery webs at night. This is a relatively large endemic species (body length about 25 mm) that hunts its prey at night. A female Auckland tree wētä (Hemideina thoracica) hides head-first in the leaves of one of our citrus trees (genus Citrus). Mäori called this species tokoriro. Our Three Kings vine (Tecomanthe speciosa) climbing one of the Queensland kauri trees (Agathis robusta) has a few large seed pods that may remain attached for several years. Tecomanthe is an endemic species to the Three Kings Islands and its conservation status is "Threatened - Nationally Critical"
Our buttercup tree (Senna corymbosa, variety "John Bull") has masses of 25 mm buttercup-yellow blooms. Our Cook Strait kōwhai trees (Sophora molloyi) start flowering in June. Its current conservation status is "at risk, naturally uncommon". 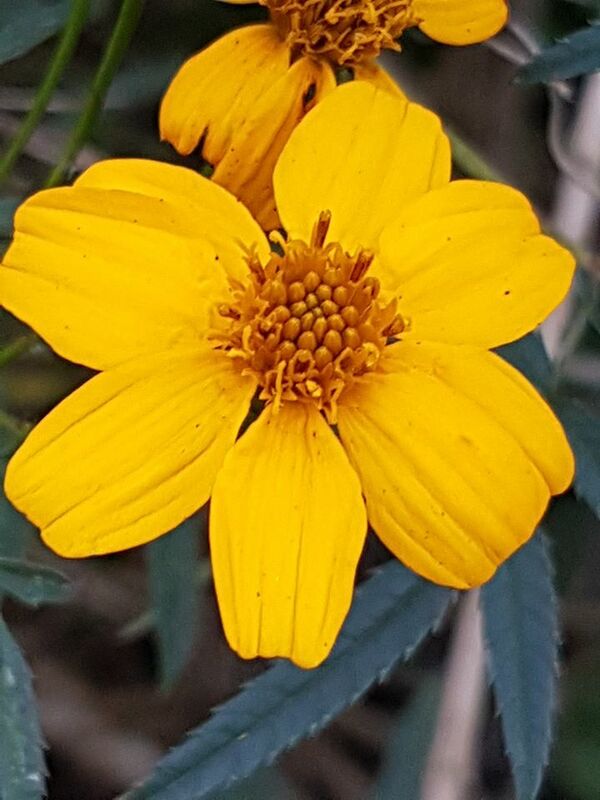 The Mexican marigold (Tagetes lucida) growing in the herb garden greets the visitor with its bright golden-yellow flowers. Globe artichokes (Cynara scolymus) are large, perennial plants with silvery-green leaves, and often more than 2 m tall at the Sanctuary Mahi Whenua. 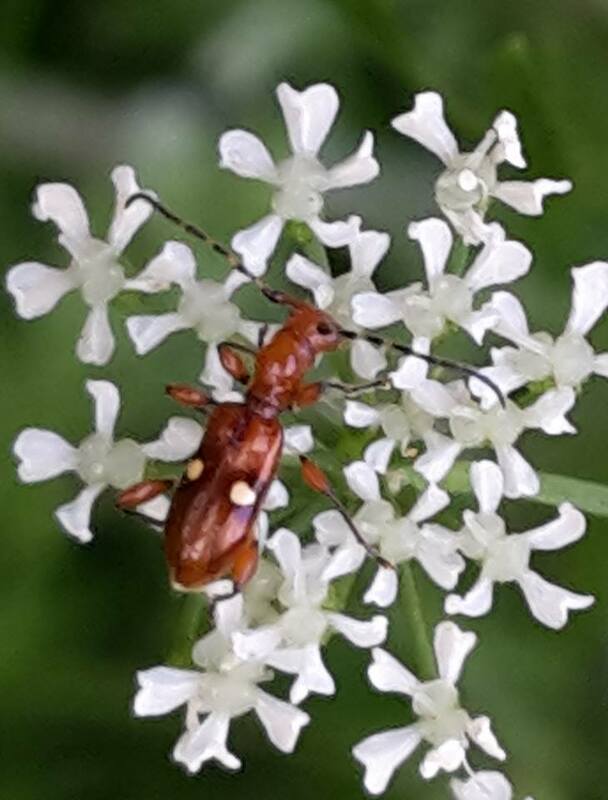 New Zealand endemic flower longhorn beetle (Zorion batesi) feeds on the pollen of a number of species, including hemlock here (Conium maculatum, and has only been recorded from the Auckland region. The kumara (Ipomoea batatas) in the puke (mounds) of the māra kumara. View through the māra boundary kānuka (Kunzea ericoides) poles shows one of the three tīraha (gifting mounds) at the front. Small berries on this large branch of taupata (Coprosma repens) at the point of ripening. Damson plums (Prunus domestica subsp. insititia) are both high in sugars and highly astringent, and are best known for jam making or flavouring gin. kōkihi or New Zealand spinach (Tetragonia tetragonioides). It is native to New Zealand, Australia, Argentina, Chile, and Japan. Captain Cook used this species to help fight scurvy on the Endeavour in the 1769 voyage. A group of 8 pīwakawaka or North Island fantails (Rhipidura fuliginosa placabilis) are living in the buffer zone of the Sanctuary Mahi Whenua.